It is great to have a sister like you. Be it times of joy or sorrow, you are always by by my side supporting me. Happy birthday! Dear sister, you are the most precious gift that God has given me. Thanks for your constant support. Wishing you a very happy birthday and have lots of fun today. Dear sis, no matter how much we fight over petty things, deep in my heart I know that you really care for me. Have a very happy birthday dear sister and keep smiling. Hey sister, I am the luckiest person in the world for I have such a sweet and wonderful sister like you. May your life be filled with tons of happiness. Wishing you a very happy birthday. Though we quarrel a lot over various issues, but you should know you are the most special girl for me on this earth. Happy Birthday dear sister! Happy … (year) birthday sister. May God bless you gorgeous. Keep smiling..Love you. Enjoy! Happy birthday to my lovely sister, I wish every year you grow as a better person, but remain my cute sister. Happy birthday dear sister, may the Jesus gives you all happiness and success in life as you grow year after year. 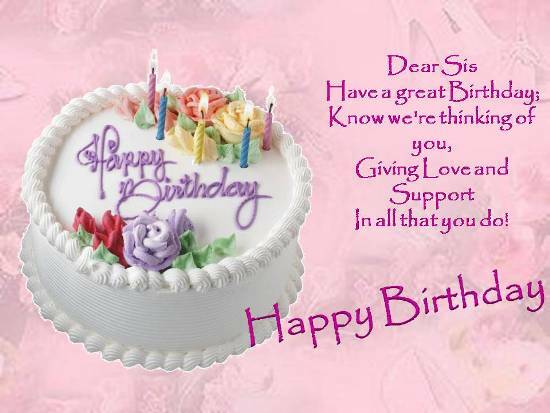 Dear sister, on your birthday I wish that every desire of yours gets fulfilled. But remember to make dreams that are realistic. Happy Birthday! Life provides many opportunities, but we have to be alert enough to grab them. So sister, keep your eyes open, grab the opportunity and you would surely get success. Happy Birthday! If things are not working out do not give up. Keep on working hard and with dedication; surely you would get success one day. Happy Birthday! There are times when we feel that our dreams would never get fulfilled. Dispel all such thoughts and always believe in your dreams and capability. Happy Birthday! You would come across many people who would pull you down and prevent you from realising your dream. Do not pay heed to them and work towards the realisation of your dream with focus and determination. There is never a dull moment with you around. You bring so much happiness and fun into my life. wishing you a very happy birthday. I really appreciate your patience. No matter how naughty I used to be, you would keep a calm attitude and handle the situation with grace. Thank God I have an elder sister. You are a a shield that protects me from all harm, including mom and dad’s anger. Dear sister, you are so patient, calm and composed, but at times you can be really funny too. Thank God, I have a sister like you. Happy birthday to the most gorgeous woman in the world and that is you, dear sis. I remember the lovely times we shared together. The little fights, sharing ice creams, playing in the park, those were really fun days. 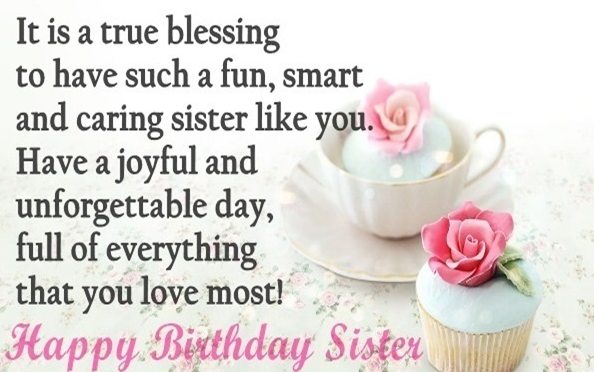 Dear sister, wishing you a very happy birthday. You are more than a sister to me. You are my best friend, mentor and guide. At times you also take up the role of mom and dad. Dear sister, I am so lucky and happy to have you in my life. Many happy returns of the day. People say that angels are only in stories, but I believe that they are right here on earth among us. And you are one of those angels, my dear sister. Wishing you a very Happy Birthday. With you by my side, I can overcome any obstacle that life would throw in my way. Thanks sister for everything and wishing you a very happy birthday. Happy birthday to the most charming girl in the world. You will always be my most cherished treasure. Happy birthday once again. I still remember those pillow fights that we had as kids and also how we played in the park. Such beautiful times, they passed too soon. Wishing you a very happy birthday; have a fun-filled day. Little sis, you have always been by my side whether it was sharing our pizzas or that blue jacket as little kids. I always want you to be there with me in thick and thin. Wishing a very happy birthday to the world’s best sister. Dear sister, at times you can really be irritating, but then, you are my best friend and sometimes a mentor also. Happy birthday and enjoy your day. Teenage life is the bet phase of our lives. So, enjoy it to the fullest. Happy birthday; welcome to the teenage club age. Happy birthday dear sister, congrats to be a teenager, but still younger to me. So, don’t try to be smarter, remain my follower. Happy birthday dear sister, you are cutest sister in this world, but always remember, never argue with your elder sister. Dear sister, on your sixteenth birthday, I want to reveal a secret of your life. You are an adopted child. HBD. I don’t know why mom and dad loves you more, when are not their own child, HBD may god give you strong heart to bear this truth. Great birthday celebration is when you cut the cake and I have it all. Let’s celebrate this birthday the same way. Remember all those fights we used to have as kids. Though we have outgrown all that, but I still want to have a little fight when you are not listening to me. Happy birthday my wonderful sister. You and I are really crazy and funny siblings. All those fights and later on apologies. It is all so much fun. I really do not know what would I do without you. Have a fantastic birthday dear sister. I remember how you ate my share of cake on my birthday. But, I am gonna get back at you on your birthday. 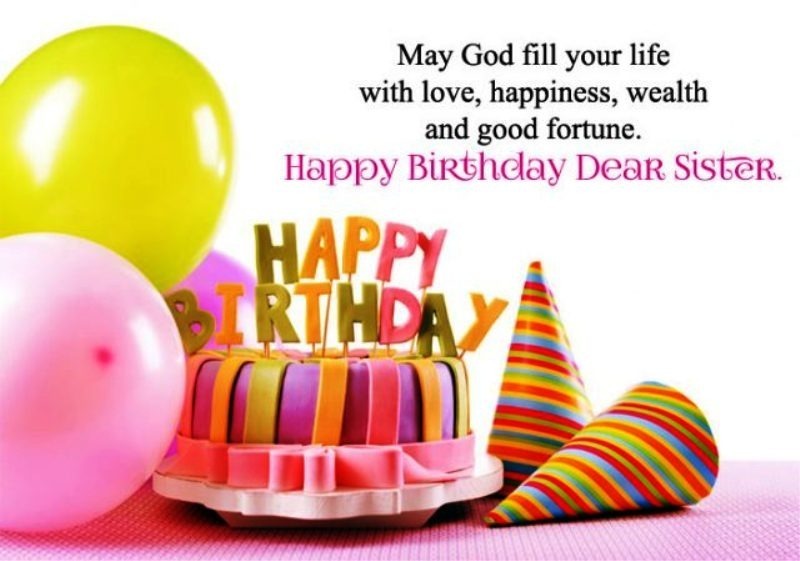 So stay alert and have a very happy birthday, dear sister. At times you tend to act silly and get me really angry. But in the end it is you who stands by me in times of need. Thanks dear sister, and have a very happy birthday. Two girls sharing one room, there are bound to be fights over very trivial matters. But, you are the best and I am lucky to have a sister like you. Wishing you a very happy birthday. I am glad to have a sister like you. You are the more like an inspiration to me than a sister. Happy birthday to you. When you will wake up, I will not be there. So, this is the message for you! Happy Birthday my sweet sister.